Delight in the real ingredients and natural flavors of Ketel One® Botanical Grapefruit & Rose. Zesty, fresh squeezed grapefruit and rose botanicals are blended with Ketel One® Vodka and distilled through a copper pot still and then infused with the natural essence of fresh, crisp botanicals. With no carbs, artificial flavors, sweeteners or sugar*, our sensible vodka specialty is the mindful way to celebrate the weekend or relax with friends. Perfect for sipping with food, mix with club soda and serve with sweet potato pierogis for a perfect house party pairing. Includes one, 750 mL bottle of 60 proof Ketel One® Botanical Grapefruit & Rose. With over 327 years of distilling expertise, passed down for 11 generations, Carl Jr. and Bob Nolet, brothers and 11th generation distillers, have created a new spirit that honors the consumer shift to more conscious living. Crafted with 100% non-GMO grain and distilled in a copper pot still, Ketel One® Botanical delivers the same great quality consumers have come to know and love from Ketel One® Vodka. Come visit us in Schiedam! We'd be happy to show you around. Please drink responsibly. • Mix with club soda and serve with sweet potato pierogis for a perfect house party pairing. By blending soft spring water with a high level of carbonation, Fever-Tree Premium Club Soda is perfect for bringing out the best flavors of finest spirits. The very best quality spring water from a source in rural Staffordshire. With a low mineral content, this water is very soft, thus ensuring that drinks are subtle in their taste and clean in their finish. High carbonation is a vital component of any mixed drink which is why Fever-Tree carbonates products to an exceptionally high level. By using small, perfectly formed bubbles, they create an incredibly smooth finish. Fill a stemmed white wine glass with ice. 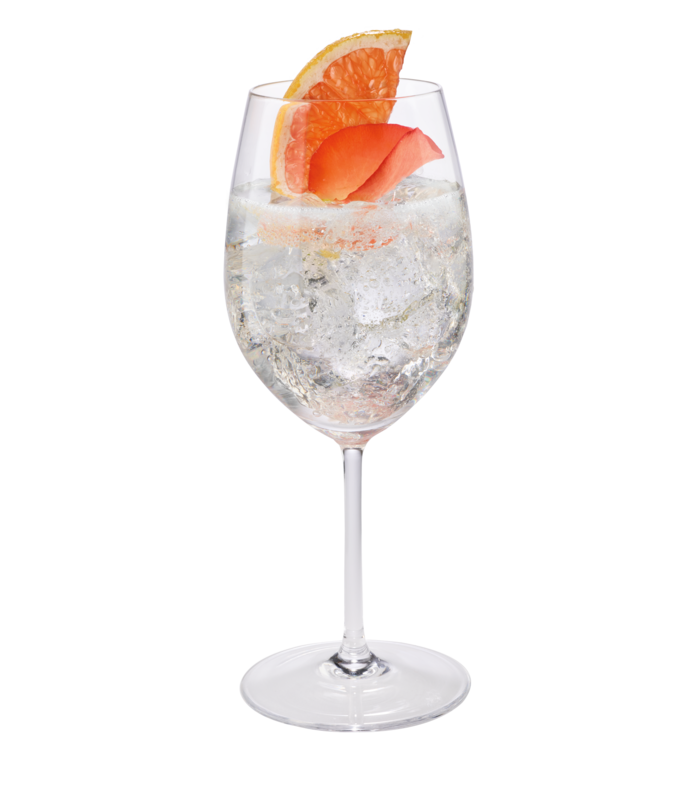 Mix in Ketel One Botanical Grapefruit & Rose and soda.